Do stock returns exhibit long-term mean reversion? That's an economist's way of asking if stocks get safer the longer we hold them. 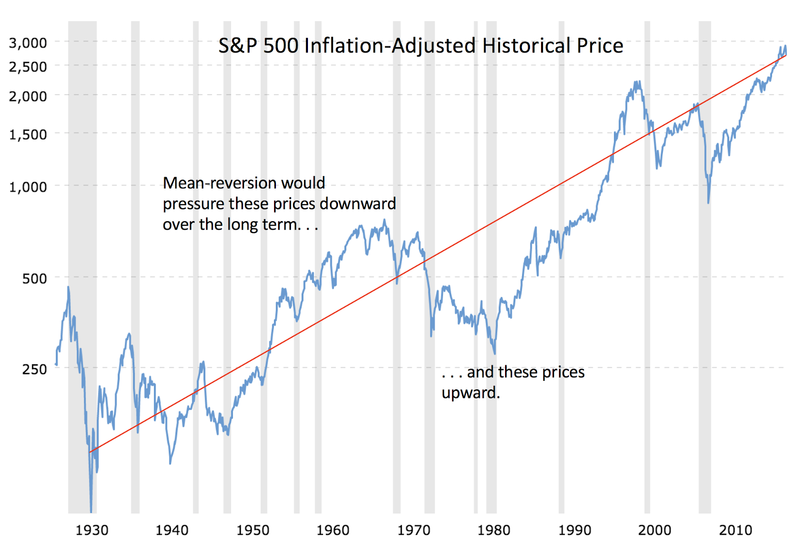 Long-term mean reversion would act like a spring returning prices back to a trend line when they advance above that trend or fall below it. The strength of this spring is referred to as its "half-life", the time it would take to recover half of a loss or — often conveniently overlooked — how long it would take to lose half of a gain. "In a survey by Ivo Welch (UCLA and Yale) in 2000, only 36 of 102 surveyed financial economists said that they believed in long-term mean reversion for stock returns (17 had no opinion and 49 did not believe). " Among those economists who believe mean-reversion exists, a common half-life is believed to be about 17 years. The longer the half-life, the weaker the effect. This is an important question for investors because, if stock returns do mean-revert in the long run then stocks are a little less volatile on an annualized basis than a random walk would imply. As retirees, we have to ask some follow-up questions beyond whether stock returns mean-revert. Does mean reversion equate to less risk? If we believe they do mean-revert, what impact would that process have on retirement plans? How would its impact compare to other factors of retirement planning? How should a retiree bet on mean reversion? Let's look at the big question first. Do stock returns exhibit long-term mean reversion? Despite extensive research for decades, there is no consensus among economists. "The claim that equity returns revert to the mean over the long term is not completely unfounded, and cannot be dismissed out of hand. However, there is at least as much evidence to refute this claim as there is to support it, and there is certainly no consensus answer within the economics profession." Well said. So, a definite "maybe." Despite the lack of consensus, many stock traders have developed strategies to attempt to profit from mean reversion of equity returns. Do the strategies work? They probably do, sometimes, if for no other reason than because nearly all strategies will work sometimes. James Davis, VP of Research at Dimensional, studied the prospects for trading strategies and found that "Evidence of mean reversion is weak, and 780 simulated trading strategies show very limited evidence of reliably positive abnormal returns [profits]." If we assume that equity returns do mean-revert, how would that impact a retirement plan? Many have the impression that the mean-reversion "spring" only pushes below-average returns back up toward the underlying average after a market decline. If you read my explanation above carefully, however, you will note that it would also push higher-than-average returns back down toward the average in the future. "The concern about future returns is justified by the fact that, while the academic research shows valuations are an extremely poor forecaster of stock returns in the short term, they are the best predictor of long-term returns. A CAPE 10 of 34 translates into a real-return forecast for U.S. stocks of just less than 3%. Add in 2 percentage points for expected inflation and you get a nominal return of about 5%, half the size of the historical return." If the market is currently highly valued, as the CAPE 10 seems to suggest, mean-reversion implies that future returns are more likely to trend downward back to the mean. So, presently, mean reversion suggests less annualized uncertainty (risk) about an expected return that is likely to be smaller — less risk but a lower expected return. Mean-reversion isn't always a winner. The popularity of the concept of stock risk declining with time grew with Jeremy Siegel's Stocks for the Long Run. 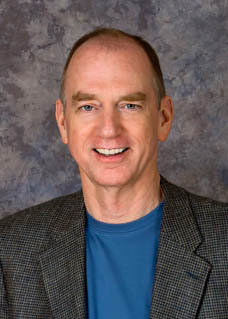 Siegel noted that over long periods of time, stocks do seem to be safer than a random walk would imply. Economist, Zvi Bodie argues vehemently that stocks are risky no matter how long we hold them. 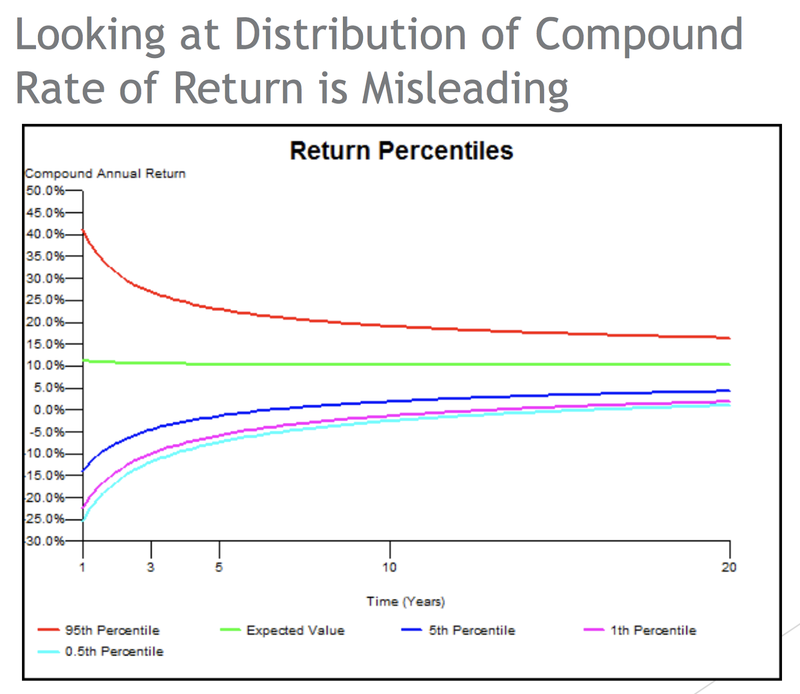 He demonstrates with the following charts that the annual compound risk measured by variance of returns does, in fact, decline with time, as statistics predicts. 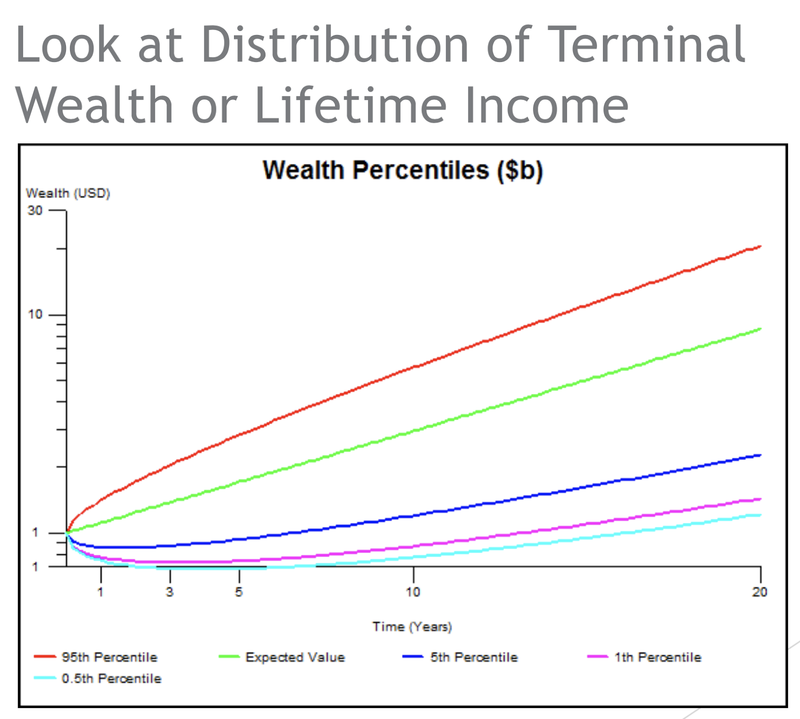 But Bodie argues that annual volatility is less a concern for retirees than the uncertainty of terminal portfolio values, which continues to increase with time. Bodie further argues that if stocks become safer with longer holding times, then the cost of insuring against a loss should also decline. (Please see Dr. Bodie's further qualification in the first comment below.) We can insure against stock losses by purchasing a put option but puts become more expensive as their expiration date extends into the future, not cheaper. You can also find papers that argue that one or the other's argument is flawed. These aren't arguments about the existence of mean reversion, however. They're arguments about the quality of the arguments about the existence of mean reversion in equity returns. You can chase the issue all over the Internet and you will always end up with "there is some evidence it exists." The problem is that we have too little historical data to argue with any certainty. There is also a behavioral aspect that could affect retirement plans. Retirees who choose to believe that stocks get safer with holding time might choose a higher equity allocation with little actual evidence to support that decision.